I’d recently moved home, and gotten a job at an auto parts store on the counter. I’d bought the 1987 F150 and sold the 1992 Saturn SC. I wasn’t really looking for another car, but a co-worker had bought a new car and offered me his old Firenza at a price I couldn’t refuse. Let me go on the record by saying I really, really, really dislike these cars. After having an ’83 Cavalier and driving a few friends’ J-cars, left me with a less than impressed opinion of them. The ones I’d experienced were slow, noisy, poorly handling, uncomfortable – about the best thing I could say about them is that they’d usually run poorly but reliably for a fairly decent number of kilometers. Another guy at the auto parts store where I worked had a new Sunfire – and it thumped and rattled over the bumps like an old bus. Alternators, axles, wheel bearings seemed to be common items to fail on them – at least we sold a lot of them at the store. I’m not fussy about what I drive – but squeaks, rattles, and thumps drive me around the bend. Anyhow, getting back on topic, my co-worker offered me the car for what I recall was $500. It started and ran well, the body, paint, and interior were immaculate, the tires good, and a fresh inspection to boot. I couldn’t pass it up for that. I figured I’d buy it, and just beat it around ’till I got tired of it. I wouldn’t lose on it. I went on a road trip once with it, to Moncton, New Brunswick, about 5 and a half hours away. It worked well enough to get there and back, but like the old Cavalier, it needed a run at the hills to make it up and over. Hit them at 100 KM/H, you’d be in second gear to the rug. After a few months passed, I started a new job working in the warehouse and parts counter of a local heavy equipment dealer. With the new job came much better pay than I’d ever gotten, and the chance to learn a new trade – I was excited. As it turned out, one of my new co-workers at the new job needed a car, and I sold it to him for what I’d paid for it as a favour. He and his wife just needed a basic car, and their old one was on its last legs. It served him and his wife well for a few years, until she had an accident with it. It was a write-off. She was OK other than her pride, but he was upset – the car had fulfilled his expectations for him perfectly, and its replacement was to come with monthly payments. I can’t complain too much about it – I only had it 6 months, but it was forgettable in my mind – I’d never even taken a picture of it. I still don’t like J-cars – do any of you have an intense dislike of any particular kind of car? I owned a 82 J2000 that I bought new. Other folks where I worked bought J cars about that time, too, but none bought a Pontiac. I won’t say that I hated that car (well, I probably did hate it while I owned it) but it sure was underwhelming to drive. For starters, something in the engine compartment made a sound that was a bit more electrical than mechanical(? ), so that the car always sounded like it had been converted to run on electricity. Over the course of 6 years/75,000 miles stupid little bits broke off. While they didn’t break off, my first attempt at replacing a damaged tire with a tire like the other 3 which the car came with was impossible. Apparently Uniroyal diverted all their production of that particular tire to GM and tire dealers could never get a direct replacement. The shift knob, which was a sort of plastic cover for the top of the shifter….crumbled, from all the vibration? The knob on the end of the manual window winder fell off. The speedometer cable rattled, something I didn’t notice right away as I was young and always drove with the radio volume cranked up. The exhaust manifold split in half….over a few hours. The front struts gave up early, and GM used a “refillable” strut that the tire store that I chose to rebuild them…. BADLY butchered. And speaking of struts, the rear hatch struts were weak when new and after a year or two I came close to being de-capitated a few times when the hatch refused to stay open. But, it did always start. And all the necessary control functions worked, even when the alternator started to go berserk and made all the lights and the wipers flash randomly. I bought a ’82 J2000 LE (really an ’81 – they started building them in spring of that year) sedan used around 1986, by which these had depreciated to a level about 40% lower than a same-year Accord that cost the same when new. Mine was green inside and out and loaded with options. The ’82 models were unique amongst J-bodies in that the interiors on the high-trim models were much more plush than in ’83 and later renditions. Mine had the full Brougham treatment – thick velour pillowy button-tufted seats, carpeted door panels, lots of (fairly realistic) woodgrain, and extra sound insulation. It was actually a nice car when it ran properly, albeit a dog-slow one. But once up to speed it was very comfortable and quiet by the day’s standards for small cars, with nice sound from the cassette stereo and awesome GM air conditioning that came through on oppressively hot and humid Maryland summers. I had frequent overheating problems (some because the radiator fan often refused to run), a bad rear wheel bearing when I bought it that was sealed so the whole unit had to be replaced, and something that drained the battery if I didn’t run the car frequently (or disconnect the + battery cable). Also after a long highway drive, when I finally slowed down to a stop the automatic transmission would stay in high gear and the car would stall. While it would start up easily, it would immediately stall again when I shifted into drive. After letting the car cool down for 30 to 60 seconds it would shift into low again and I could drive off. When I bought the car it had one tire a different size than the others, and *none* of them were the correct size! Even though the tread was adequate, I replaced the tires first thing with new Vredesteins, one of about two brands still making 195/70R13 tires. I dislike anything made by Kia. I know their cars are fine now, even good, but l can’t shake the experience l had with my Rio. Like your J Car, you needed a ten foot run up on most hills and it rode like a go kart. Taking that experience with me, l have a deep seated anger at Kia, and will never buy another of their vehicles, no matter how competent they get. Frankly, it only took them TEN YEARS to figure out what Honda had in the 70’s. Give people an inexpensive, WELL BUILT car, and you’ll have a customer for life. Who cares about “America’s best warranty” when the car you’re driving is so mediocre? It’s life support for a car that just isn’t worth it. I don’t mean to defend the Rio, per se. But which of it’s competitors wouldn’t have had the same lack of power? I have bought way too many cars like this over the years. The right price has a way of making things ok in a decently presentable car. Interesting write-up and question. The phrase “about the best thing I could say about them is that they’d usually run poorly but reliably for a fairly decent number of kilometers” reminds me of something I’ve heard others say: “most GM engines run poorly longer than most other engines run at all”. I had an ’84 Chevy Cavalier hatchback that ran very well for a long time. The main problem with it was it was as if no one at GM took care of the details. Things like poor paint quality, lousy OEM tires, a leaky hatch, a balky manual shifter, and a turn signal stalk that when used to signal would also swipe the windshield wipers once. But the car never let me down, got great fuel economy, and drove well for well over 100K miles. “Do any of you have an intense dislike of any particular kind of car?” Everyone has their opinion . For me, there are no cars I intensely dislike. There are just some I wouldn’t own or drive if I had a choice about it. We owned a Mazda once that rusted incredibly badly and quickly, so Mazda would have to work awfully hard to earn my business again. I’ve driven several models of the Prius, and I know many people like them, but I’m just not a fan. Likewise I’ve driven several large SUV’s like the Tahoe, and don’t like them. To each their own. The only thing I like about a Hyundai is having fun saying the word “Hyundai”. Though few remain, seeing a Cadillac Cimarron on the street sets me off. I had a Olds Firenza given to me when I was in college. It did what I needed it to, although the ohc engine did require a head gasket swap (at ~50k miles), which I completed on my gravel driveway outside of my “apartment”. Anyway, it was free and it’s faults forgiveable. At the same time, I was dating a girl that drove a newish Sunfire, and I couldn’t help but notice GM hadn’t really improved the poor j car. In fact, I really developed a hatred for that Sunfire. They were nearly the same driveline wise, with 120ish hp and 3 speed autos (in 2000, really GM!? ), but where the Firenza was lithe and uncluttered, the Sunfire was fat. It had weird bulges inside and out, a dashboard straight from a cozy coupe, and the worst driving position I’d ever encountered. Fair or not, I decided anyone that could be snookered into buying something like that new was probably not what I was looking for long term. I’ve often wondered HOW many Hondas were “sold” by driving and owning the various J-cars? Don’t they have problems with overheating due to lack of front radiator grill? There’s an intake below the front bumper that directs a flow of air to the radiator. It was fairly common in US cars of that era, especially among Ford products. Today, many grilles have louvers that automatically shut when the car reaches a particular speed and the engine temperature is below a certain level, to aid the vehicle’s aerodynamics. You just reminded me, I think I had to put a radiator in this or the ’82 Cavalier. I can’t remember which. 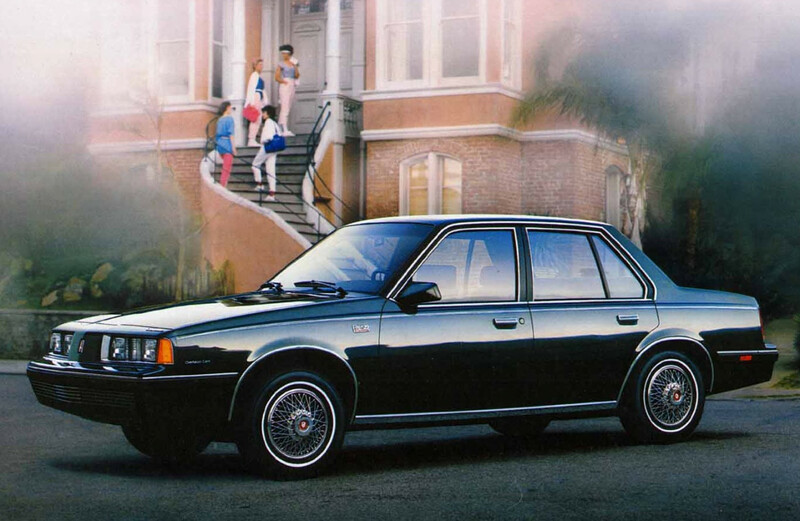 In the mid-80s, I had a brief fling with a Frrenza as a company car. Although it cost me nothing, I still felt like I overpaid and got ripped off. 88 Dodge Shadow. Bought it with 12,000 miles on it for my wife. My wife liked it because it was small and blue. Actually a trouble-free car except that it kept warping the brake rotors. But, heavens, was it slow. I had the 2.2 in my 86 Caravelle and it was willing. For some reason the 2.2 in the Shadow could hardly get out of its own way. I grew to dislike that car, even though it really did nothing to deserve my hatred. 1980 Buick Skylark-I don’t need to say anything else. I don’t follow. You’ll need to elaborate. ’82 Chevette Diesel Automatic. Every sales manager got one of these as a company car (long story). Only demo I’ve ever parked in front of the dealership and didn’t drive. Bought a ’83 T-Bird Heritage from our Ford store and drove it instead. Yes, I parked it in front of the Chevy Store in my usual spot. Sometimes I’m not that subtle. The Used car manager bought a new Coupe de Ville from his brother and parked it next to mine. Miraculously we both still had jobs. ’74 Chevy Vega. Brought new meaning to the words “unreliable” and “depreciation.” Replaced it the next year with a used ’69 Malibu Coupe. Actually paid more for the Malibu than I got for the Vega. And it was worth it. ’73 Fiat 124 Spyder. Fun to drive… when it ran. Tried to kill me early one morning in downtown Portland when it caught fire. Apparently Chevette Diesel did not offer AC at all, Consumer Guide says 0-60 22 seconds for 5 speed manual, can’t find auto 0-60, must be in the 30 second range. I would have parked it too. Especially if this was SoCal. If it was as fast as it was noisy, it could’ve turned a 14 sec. 1/4 mile. I can’t imagine what one with A/C would drive like- Portland has some pretty steep hills. The sales manager that dreamed up this Chevette Diesel promotion got canned, and I wound up in that job. Had to promise the dealer to take a Chevy demo though. I took a Monte Carlo- and didn’t mention the T-Bird was still twice the car. One car I totally dispised was the baby 80s LTD ll. I drove one as a cab when my normal car a volare was being fixed. That LTD was ugly, small, had no power, and the most uncomfortable back pain inducing seats I ever sat in. I hated that car. I hated even the name. Like is Ford to uncreative to think of a new name? It was a horrible car. It always had issues. There’s a lot of cars I dislike, but few of them I’ve actually been in. Of the ones I do dislike, two come to mind. First is the Prius, I know it seems like a cheap shot, but I have been in Prius’s (Prii?) before and I always feel claustrophobic inside of them. It’s the only car I’ve been a passenger in that accomplishes that, and I’m not a fan for that reason. As for the second one, no contest, Subaru Forester. I’ve driven a 2001 Subaru Forester my sister owned, and I hated it. Cramped footwell, gutless engine, questionable handling, bad ride quality, it was a relief whenever I got out of it. Then when my first engine blew up, my dad asked his “Friend” to let me drive her’s, which was an 05. You would think that the next generation would be an improvement, but no. Same problems as my sister’s, just with the addition of a gated console shifter that made changing gears an unnecessary hassle. Those two experiences have sworn me off of Subaru forever. That was the Ford LTD,, (fox platform). And the Marquis. Reskinned Fairmonts. Also the Firenza & Skyhawk, likely lost sales, in the mid and later 1980’s when gas prices went down. I am going to add an odd one: my 1997 Acura Integra. It was my shortest ever ownership of a car. I had owned an 86, replaced with an 88, and then added a 93 for my wife. All very nice cars and satisfying to drive. Service (which I rarely needed) was impeccable. However, in early 1993, I was sent to Central America by my company. It made no sense to even try to ship the 88 or the 93, so they were sold. Upon returning to the US in December of 1997, I needed a car. It made no sense to me to rent for a month while I car-shopped. Instead, I essentially took a taxi to the Acura dealership. Since I knew what to expect from Acura, I didn’t even test drive the car. (No, I will never do that again, but I was in a huge hurry since I needed to report to my new job). The Dealer was fair enough on the price but that car was a total disappointment. The interior was a stripper with single piece plastic door panels. The Alpine stereo wouldn’t hold a signal. The seats were hard, and the upholstery started showing wear at 10K miles. The digital clock lost time and had to be reset every week. The headlights fogged and had to be replaced. Worst of all, the car was incredibly noisy – to the point I had it “dynomatted”. I later found out that the Civic was a much nicer car for about the same price. Mechanically the Integra was problem free (except for the headlights) but it felt so much cheaper than the previous Integras. I dumped it at 11K miles, and havn’t been back to an Acura since. The first three cars set expectations- the fourth crushed them. I am still sort of a Honda fanboi, but I leave owning Acuras to others. Are there any cars that I dislike? Many. But there is one that I hate. The Nissan Cube. It is a visual assault that just defies logic. It looks like a washing machine, but everyone knows that you bought the ugliest washing machine because you drive it around town! WTF? I would have rocked the Oldsmobile J-body. Growing up near Lordstown, there were many of these on the streets. Any number of friends and relatives had some variation of the local product. My favorites were the V6 powered ones, they had a pretty decent punch for the day. I guess hate is a really strong word. I’ve owned some cars that were constantly breaking/broken which led me to hate the individual car. One was my 1980 Mercury Capri RS turbo, a very well equipped car, but one that ran poorly and I paid dearly for, in more ways than one. 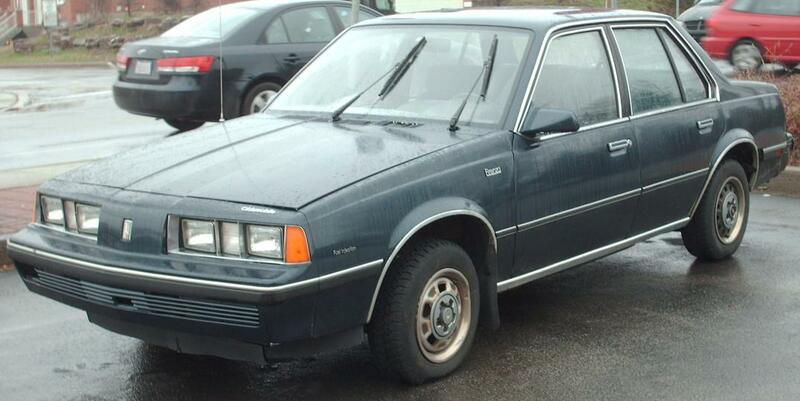 I’ve had a few other cars that were pretty bad, but you always remember your first one. If there were a class of car that I dislike, it’s the Prius. Not the actual car, but the politics surrounding it. I thought and still think that the hybrid drivetrain is a good idea for commuters, I really disliked the heavy incentivization of the car when the 2nd gen was released. When I was a young man in the 80’s, I hated minivans. I still like to make fun of them and their drivers, even though I am one. It wasn’t until my own kids appeared on the scene and we were able to borrow our in-laws’ “magic wagon” that I began to appreciate them. I feel the same thing is happening today with C/SUVs; real “car guys” dismiss them as useless toys, but the reality for many people is the vehicles are fairly useful. We’ve discussed this on this blog, that the C/SUVs approach the ergonomic values of 1930’s sedans. I guess it’s history repeating itself, just this time in a different wrapper. I try to avoid absolutes like never, I’m a shades of gray kind of guy. Right now I don’t envision myself in a C/SUV, but who knows what the future will bring? It’s funny the difference the right engine in a car makes. A 2.8 in one of these would have been a ball to drive. This one with the pushrod 4 just reminded you that it was a penalty box. From a styling aspect, the most recent car I severely dislike and wouldn’t drive (much less own) is the Chevy Aveo sedan. I could tolerate the hatch, but the Aveo sedans, to me, simply scream “Loser!” as they limp down the road belching out great clouds of blue and/or grey smoke (and probably some other colors) from their tailpipes. From the inside, it would be cars that have an offset steering wheel not positioned directly in front of the driver. Ironically, the car I remember most vividly is none other than the first J-car! Later versions fixed it, but the first Cavaliers and its variants had a steering wheel that was a couple of inches to the left of the center of the driver’s seat. If they couldn’t get something as rudimentary as the steering wheel centered properly, what else didn’t they do right? And, believe it or not, the previous version of the Chevy Silverado pickup actually had the same exact problem! WTF, GM? I’ve posted about this before, but my ’94 Saturn SL-2 soured me on the brand. On Carfax (and paper), it seemed good. But after I forked over the $….wow. It wasn’t that it wasn’t reliable. It just always had something wrong with it, PLUS the @#$!ed automatic seat belts.